Lean back and enjoy the ride on the Matrix R50 Recumbent Bike with the XIR Console that combines stability and versatility while distributing weight for maximum comfort and support. The convenient step-through design of the R50 features our exclusive Exact Force Induction Brake, Dual Form Frame and Comfort Arc Seat. Our XIR console includes a stunning HD display and an intuitive home screen that offers easy access to entertainment. Includes expanded Bluetooth connectivity to user devices. The R50 leads the Matrix recumbent bike series for home gyms. The users can relax into its oversized high-backed seat, but they can take exercise seriously with the precision of Exact Force™ induction braking. The Matrix R50 has 30 resistance settings and is compatible with three Passport-ready consoles. Recumbent bike shoppers have an exciting new option from Matrix Fitness: The Matrix is best known for commercial and home fitness equipment. The R50 is not only the Matrix's best recumbent bike, but also stands apart from Matrix’s competitors. The R50 is the first recumbent exercise bike to use induction braking, which is especially smooth, responsive and precise compared with the market’s other options. This high-end bike also features a deluxe high-backed seat, customized electronics, and a compact frame compared with other recumbent bikes. An excellent end-to-end warranty package helps buyers choose this new ride with confidence. The R50’s frame can be paired with any of three consoles. 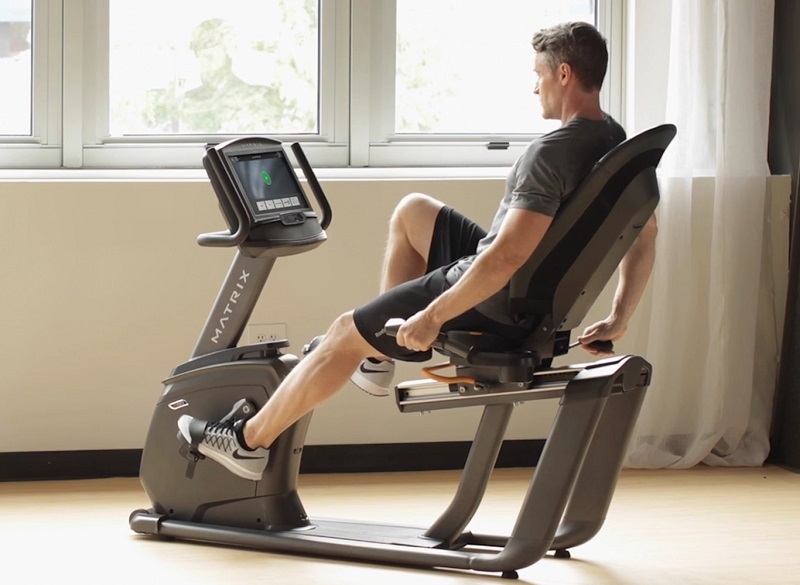 These give the options of an exercise-only focus (plus reading rack) or training with extra features such as integrated speakers, mobile apps and a web browser. 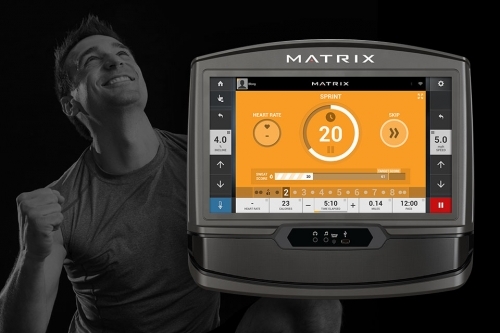 Matrix consoles also differ in terms of their display screens and workout programming. One option has a traditional one-color LED, but the top console (the XIR) shows off a 16″ touch screen, a web browser, integrated video workouts, an app for eight-week training programs and much more. The Matrix R50 recumbent bike is ideal for trainees at any skill level who aim to respect their knees while getting a great cardio workout. 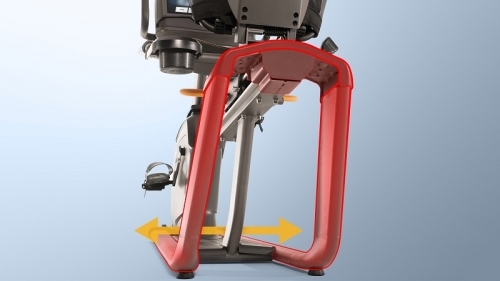 The high-end induction resistance of this bike can meet the gentle needs of physical rehabilitation but also provide the powerful resistance preferred by trainees in better condition. High Quality Frame: The Matrix R50 has a nearly 175 pound (80 kg) frame under lifetime warranty. The frame is especially designed for easy access and stability. Compact for a recumbent bike frame, it takes just 63″ x 26″ of floor space. Induction Braking: The Matrix R50 features induction braking for ultra-smooth and quiet transitioning among resistance levels. 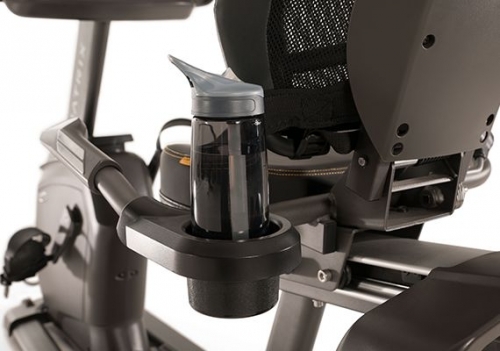 Compared with the majority of other high quality recumbent exercise bikes, which use magnetic braking instead, the R50 responds even more quickly to the user’s commands. Trainees get 30 resistance levels rather than the usual 20, so training is more tailored as well. Mesh Seat: A high-backed seat is a key to the comfort of a recumbent cycle. The mesh design of the R50 bike seat allows for airflow along with lumbar support. The bike seat is oversized for comfort. Interchangeable Pedals: Pedals on Matrix bikes are self-balancing, which makes for easier mounts and dismounts. They can be replaced with standard bike pedals if desired. Heart Rate Monitors: Matrix recumbent bikes support both contact and wireless heart rate monitoring. Contact pulse sensors are built into the R50 handlebars, and all three consoles have wireless receivers. 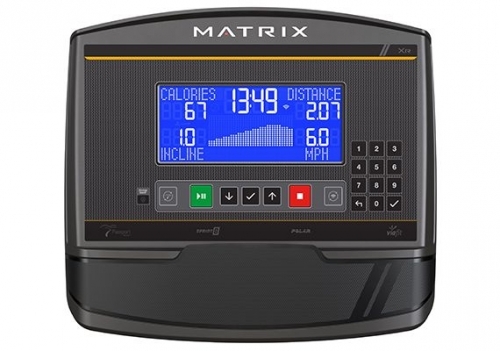 Console Choice: Matrix home exercise bikes are compatible with the XR, XER and XIR consoles. The simplest option is the XR console with 8.5″ LCD, five classic workout programs, wireless data sharing, and Passport readiness for viewing immersive Virtual Active video on a big screen TV. Virtual Active lets you lean back and virtually roll through scenic destinations worldwide! The sights and sounds automatically adjust to match your motion… The middle console option is the XER with 10″ touch screen, ten standard workouts, built-in video, Passport readiness and Sprint8 training programs described below. Additionally the Matrix XER has apps for Facebook, Hulu, YouTube and more. 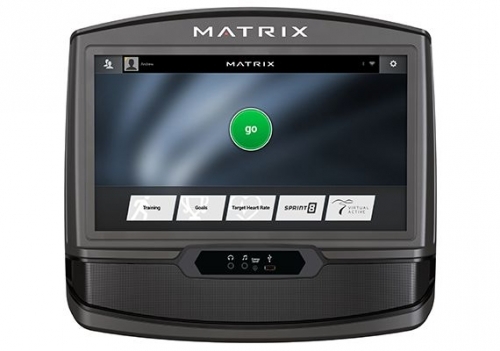 The top Matrix R50 bike console is the XIR with 16″ touch screen. It has the same features as the XER but a larger screen, one more preset workout program, and a web browser. Virtual Active: Virtual outdoor bike tours are supported by all Matrix R50 consoles. Virtual Active presents high-definition “bike’s eye” views of beautiful destinations around the world, from the Hawaiian Islands to the Swiss Alps and beyond. The views and audio respond to the rider’s pace to help create immersive experiences. Virtual Active videos are built into the XER and XIR consoles and viewable on their touch screens. Another option with all R50 bike consoles is watching Virtual Active on your own TV. The larger the screen, the more immersive the experience… Using Virtual Active with a TV requires a Passport Media Player (not included). 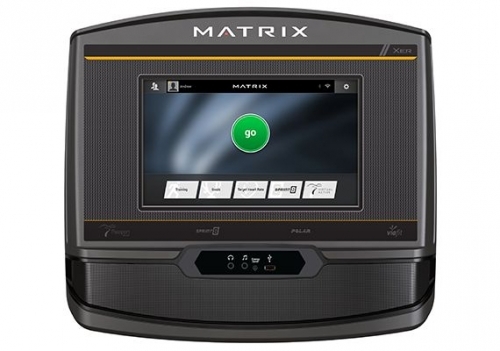 Sprint8: The Sprint8 training app is built into select Matrix consoles. Sprint8 delivers eight-week high intensity interval training (HIIT) and includes a test to help trainees choose the best challenge level. These HIIT workouts bring results very efficiently: Bike just 20 minutes 3-4 times/week for less fat and more lean muscle mass along with a better cholesterol reading. 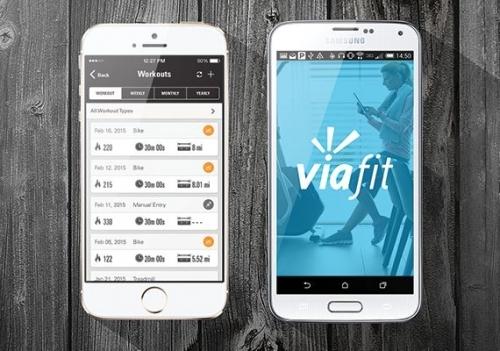 Data Tracking: The Matrix R50 has ViaFit connectivity for easy data sharing with other apps and fitness tools. Additionally the Matrix XER and XIR have MyFitnessPal on board. 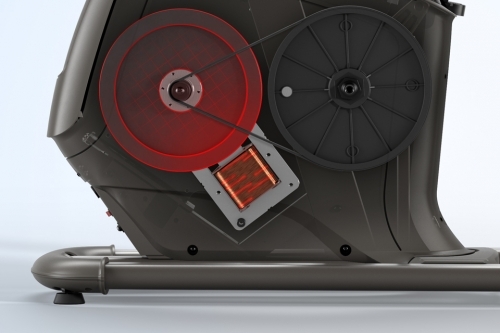 Audio: Speakers are integrated with the XER and XIR consoles. They are 3W and 5W, respectively. Each of these consoles has a connection for an MP3 player. Water Bottle Holder: Each Matrix bike console has a water bottle holder. High Capacity: Matrix recumbent exercise bikes have 350 pound (159 kg) weight capacities. Compact: A big selling point for the R50 is its small size. This recumbent bike measures just 63″ long x 25.6″ wide x 48.4″ high (160 x 65 x 123 cm). Warranty: includes lifetime protection for the frame, seven years for parts, and two years for labor. Each console has a five-year warranty. 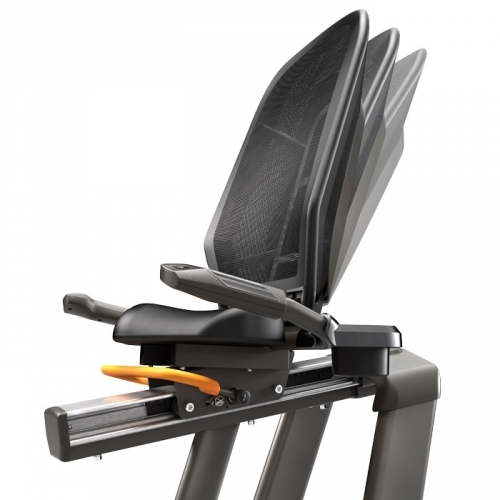 Call 1-800-875-9145 to speak with one of our fitness advisors with any quesitons you may have about the Matrix R50 Recumbent Bike with XIR Console. A high-backed seat is a key to the comfort of a recumbent cycle. The mesh design of the R50 bike seat allows for airflow along with lumbar support. The bike seat is oversized for comfort, but it is interchangeable with other seats as well. Assembled Dimensions (L x W x H) 63" x 25.6" x 48.4" 160 x 65 x 123 cm / 63" x 25.6" x 48.4" 43" x 25.2" x 47.2" 43" x 25.2" x 47.2"
Order your Matrix R50 Recumbent Bike with XIR Console from FitnessZone.com today!